1. Beginning possibly as long ago as 4000BC in Babylonia, the word honeymoon comes from the tradition of the bride's father giving newlyweds a moon (month) worth of mead. Anthropologists have speculated that with the poor diet of European Peasants in the middle ages (when the practice was common), the nutritional boost of the honey may have allowed higher rates of fertility. where men devoted to the Gods are happy. the well of meath in Vishnu's highest footstep." 3. The English word Medicine is descended from the Welsh word Meddyglyn, meaning mead made with herbs. The Welsh word was later Anglicized as Methyglyn, with a variety of spellings. 4. Mead may be the oldest alcoholic drink, possibly even predating man. Lightning struck bee trees would provide bowls for rainwater and honey to gather in, and when an airborne yeast arrived, mead would naturally occur. Ancient writings from around the world praise mead in a wide variety of cultures. 5. 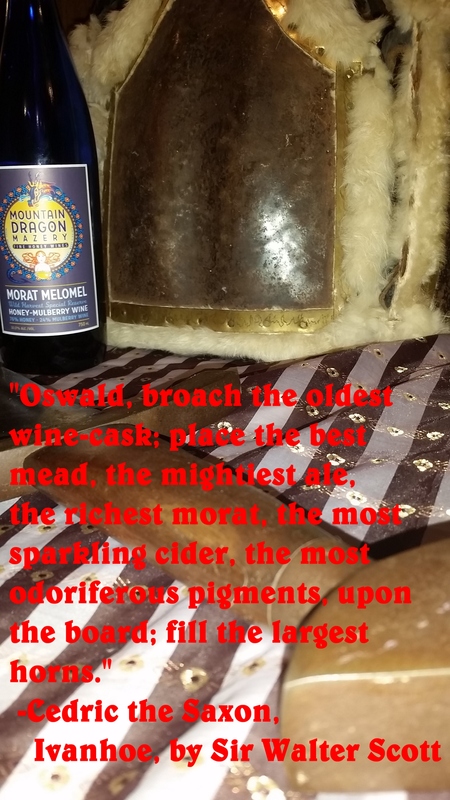 Odin, father of the Norse gods, traded his eye for a drink of the mead of wisdom. 6. Thor stole a mile wide copper kettle from the king of the giants to brew enough mead for Aegir's Feast. 7. Bragi, son of Odin, whose tongue was carved with runes, gave the mead of poetry to mortals to inspire them to poetry of their own. 8. Odin's Daughters, the beautiful Valkyrie, serve mead to fallen heroes in Valhalla. Which the bees collect, and do not enjoy. Mead distilled sparkling, its praise is everywhere." 10. "Drank of the mead seven bumpers; his spirits rose, (and), exultant, Glad was his heart, and cheerful his face"
11. "It was believed in India that the sap of plants was influenced by the moon, the source of vitalizing moisture and the hiding-place of the mead of the gods." 12. "Of honey let the forest smell, the blue backwoods—of mead, of melted butter"
To a wonderful palace that is mine? And crimson as the mead are the lips of the lovers." This collection literally only scratches the surface of the classical references, cultures, and traditions in which fermented honey was featured. Do you have a favorite mead reference of your own? Let us know, we'll be glad to hear from you at: meadlore@mountaindragonmazery.com. Include a brief citation if you can! Thanks!